AIM-listed W Resources Plc has announced the early commencement of production at its La Parrilla open pit tungsten and tin mine in the Extramadura region of southwest Spain. The production from the existing concentrator using tailings material at the plant is the first step in building up to full mine production in H1 2019. 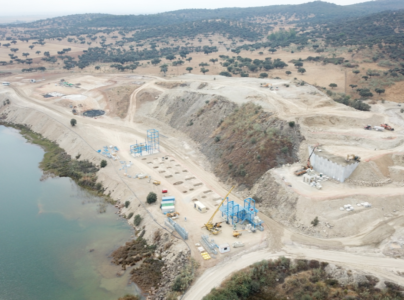 In Q1 2019 the company plans to switch from tailings feed to higher grade ore from the mine once a crusher is completed and commissioned in December. Construction of a large scale concentrator is scheduled for completion in Q1 2019 which will allow ramp up to design capacity over the course of 2019. The design capacity of the “T2” development is an annual output of 2,500 tonnes of tungsten concentrate and 500 tonnes of tin concentrate. The tin content of the concentrate is targeted at 60%Sn + so we estimate that a production rate of some 300 tonnes a year of tin-in-concentrate is possible by the end of 2019. Design and engineering of T2 leaves open the possibility of ramping up output to 3.5 million tpa (the “T3.5 Expansion”) with further investment in the future. Our View: W Resources has already produced small amounts of tin and tungsten since 2014 from historical mine tailings at the site on a campaign basis, following an economic decision to integrate such reprocessing with the current development of the open pit mining operation. The targeted volumes of tin output are small on a global basis, but if achieved they would make La Parrilla the largest European producer of tin-in-concentrate. W Resources will hope to have better success than Wolf Minerals, whose Hemerdon tungsten-tin mine in the UK ceased production in October following the company’s collapse into administration. La Parrilla’s geology should help the operation avoid some of the geological issues which hampered the Hemerdon mine ramp-up, which included processing issues related to high levels of clay and fines.